An exact replica of the physical body but composed of finer matter. The term is chiefly employed in Theosophy, and those numerous occult systems derived from it, to denote the link between the nervous system and the cosmic reservoir of energy. 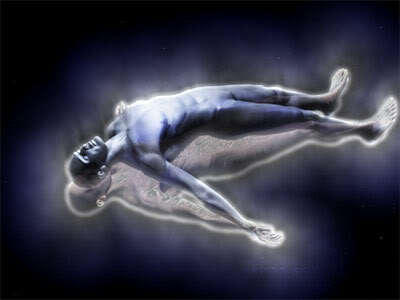 The astral body corresponds to the double of out-of-the-body experiences reported in psychic research. The term double, however, is less comprehensive and refers only to the living; astral body refers specifically to the bodily counterpart of the dead. The etheric double or body, in Theosophy, is distinct from the astral, but in Spiritualistic literature they are often interchanged. These concepts derive from traditional Hindu mysticism, though there are also Western precursors. The astral body is the instrument of passions, emotions, and desires, and, since it interpenetrates and extends beyond the physical body, it is the medium through which these are conveyed to the latter. When it separates from the denser body—during sleep, or by the influence of drugs, or as the result of accidents—it takes with it the capacity for feeling, and only with its return can pain or any other such phenomena be felt. During these periods of separation, the astral body is an exact replica of the physical, and as it is extremely sensitive to thought, the apparitions of dead and dying resemble even to the smallest details the physical bodies which they have lately left. The Astral World is said to be attainable to clairvoyants, and many claim that the appropriate body is therefore visible to them. In accordance with theosophical teaching, thought is not the abstraction it is commonly considered to be, but is built up of definite forms, the shape of which depends on the quality of the thought. It also causes definite vibrations, which are seen as colors. Hence, clairvoyants may tell the state of a man’s development from the appearance of his astral body. For example, some suggest that a nebulous appearance indicates imperfect development, while an ovoid appearance betokens a more perfect development. As the colors are indicative of the kind of thought, the variety of these in the astral body indicates the possessor’s character. Inferior thoughts produce loud colors, so that rage, for instance, will be recognized by the red appearance of the astral body. Higher thoughts will be recognizable by the presence of delicate colors; religious thought, for instance, will cause a blue color. other hand, commenced to ascend, and there is, therefore, a continual opposition of forces between him and his astral body. Hence, the astral body accentuates in him such grosser, retrograde thoughts as he may nourish, since the direction of these thoughts coincides with its own direction. If, however, he resists the opposition of his astral body, the craving of the latter gradually becomes weaker and weaker, till at last it disappears altogether. The constitution of the astral body is thereby altered,for gross thoughts demand for their medium gross astral matter, while pure thoughts demand fine astral matter. During physical life the various kinds of matter in the astral body are intermingled, but at physical death the elementary life in the matter of the astral body seeks instinctively after self preservation, and it therefore causes the matter to rearrange itself in a series of seven concentric sheaths, the densest being outside and the finest inside. This state is not eternal, and in accordance with the evolutionary process, according to Theosophists, the gross sheath of astral matter wears slowly away, and the individual remains clothed with the six less gross sheaths. These also, with the passage of time, wear away, being resolved into their compound elements, and at last when the final disintegration of the least gross sheath of all takes place, the individual leaves the Astral World and passes into the Mental. However, this rearrangement of the astral body is not inevitable, and those who have learned and know are able at physical death to prevent it. In such cases the change appears a very small one, and the so called dead continue to live their lives and do their work much as they did in the physical body.